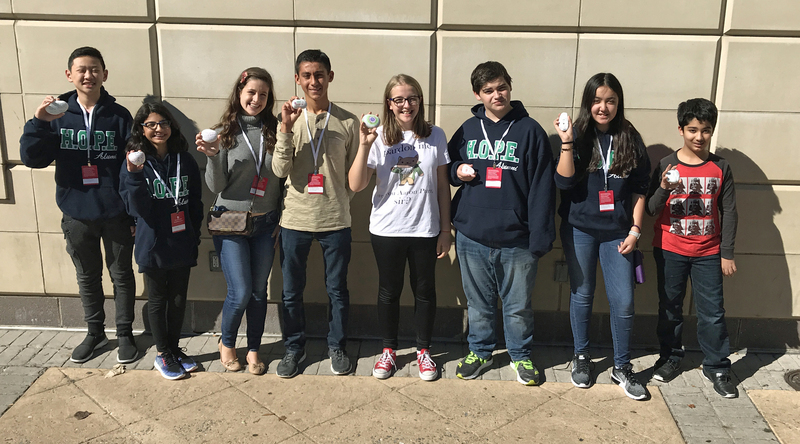 YORBA LINDA, Calif. (October 18, 2017) – This week, while on the annual trip to Washington D.C. and New York, students from Heritage Oak Private School spread kindness by leaving “kindness rocks” at various destinations along their tour. Inspired by the nationally known “Kindness Rocks Project” (www.thekindnessrocksproject.com) and implemented by Heritage Oak’s newly-formed Middle School Kindness Crew, the kindness rocks are meant to inspire and encourage the individuals that find them and recruit those individuals to also perform a random act of kindness. Upon arriving in Washington D.C. on Saturday, students began creating their individual rocks, each with an inspirational message or image. Each student then had an opportunity to determine where he or she would place the rock. Students placed rocks on the campus of Georgetown University, at a rest stop in Delaware, at the Statue of Liberty, near Rockefeller Center, at the 9-11 Memorial, on the subway and in various additional locations. Heritage Oak’s Kindness Crew is made up of sixth through eighth grade students who work to implement acts of kindness schoolwide and throughout the world. The crew follows the program outlined by “Think Kindness” (www.thinkkindness.org) and partners with other students throughout the United States to exchange ideas.